Are You Lifting Enough Weight? - Welcome to SarahKesseli.com! Are You Lifting Enough Weight? I came across an article from SparkPeople.com that was titled, “4 Signs You Need To Lift More Weight” and knew immediately that I wanted to share it with you! Quite often, people will ask me, “Why is my body not changing? I am working out consistently, eating right and doing all the things I am supposed to. Yet my body is no different” Of course, my first question is always, “What does your workout program look like?” Normally we would talk through it and, like the article from Spark People, I would find that the persons exercise program has stayed consistent for long periods of time. The body has plateaued and is no longer being challenged, which will halt any further results. 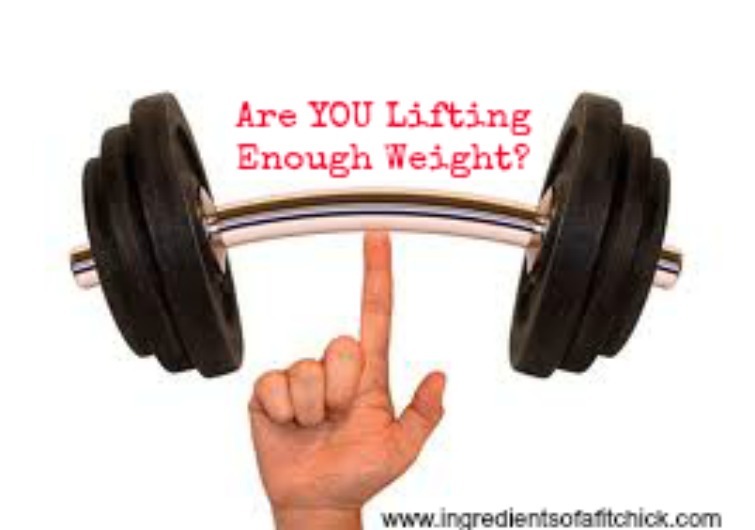 So how do you know if you are in need of an increase in the amount of weight you are lifting? Here are 4 signs from SparkPeople that are great indicators that it’s time to kick up your routine! The current weight you are lifting isn’t a challenge. Strength training is meant to be challenging, because the whole point is to “overload” your muscles so they get stronger. If the weight you are lifting isn’t as challenging as it used to be (or isn’t challenging at all! ), then it is time to increase the resistance. You could go forever. Each strength training exercise you do should cause you to feel muscle “fatigue” within 15 repetitions (or fewer). Muscle fatigue feels like you couldn’t possibly do another repetition in good form. If you can do more than 15 reps in good form, or if you literally feel like you could go on forever because the resistance you’re using is so easy, then it’s time to take it up a notch. You have never increased the weight you lift. When you first started strength training, then the weight you lifted was a starting weight. Continuing to progress in strength training is essential to getting the most out of your workouts—that means lifting more weight as you get stronger over time. The progress has come to a stop. Without making your muscles work harder than they’re accustomed to, they won’t get stronger. As you train, your muscles will grow stronger in order to meet the demands you are placing on them. So if you keep offering them the same workload, they will keep working the same amount, and progression comes to a grinding halt. Take a look at your current routine and see if any of these apply to you! If so, it’s time to mix things up! Start by increasing the weight you are using by 10%. You want to fatigue your muscles in the last 2-3 reps of your workout…..not reps 97-100 either 😉 Stay with a max of 15 repetitions. Week over week try to increase your weight and keep the exercises you are doing new! These are the keys to results! If you have found yourself at one of these points and are unsure where to turn, please head HERE to get started on your new exercise program! Together we can work together on creating a customized workout plan that will help you achieve those goals! So are YOU ready to move some weight? *Are you experiencing any of the above signs? *How do you keep your body challenged? *How frequently do you change your workouts?